Publishers today can no longer ignore the Web, which has become a primary source of lexical information for end-users. The TLex Online Dictionary Publishing System can be used to publish dictionaries, terminology lists, or any other kind of data on the Web. 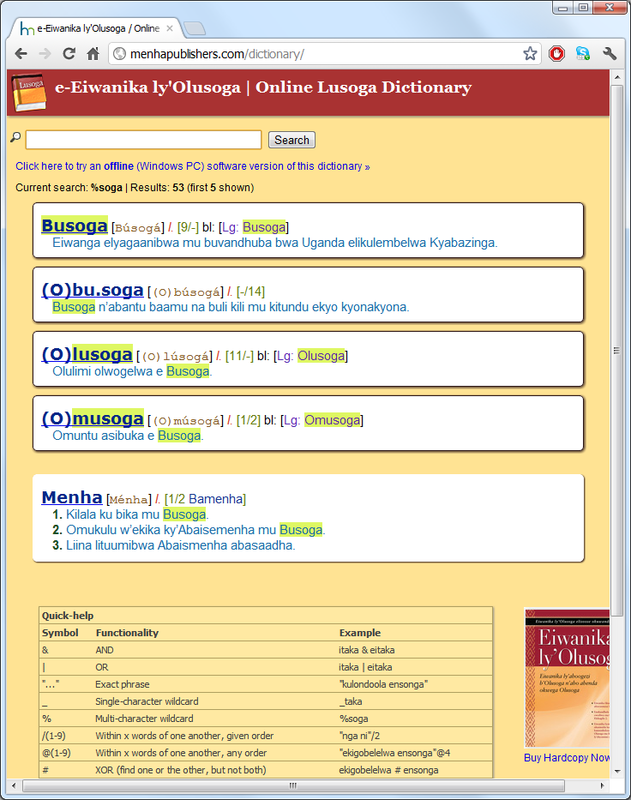 End-users can search the dictionary from within their Web browser. Contact us now and let us help you place your dictionary, terminology list or any other data on the Web! We provide the full range of Web publishing services. "Click to Publish": Instant-publishing of dictionary content updates from within TLex. Extensive logging – all end-user searches, including both successful and failed searches, are logged in detail. Comprehensive search and visitor statistics allow you to see in real-time what words users are actually searching for most frequently, and, in particular, the most frequent misses. Dictionary compilation efforts can then be prioritised accordingly, based on the actual needs of users. Every search is date and time-stamped, and linked to the website visitor that performed that search; returning visitors are also tracked, allowing you to see the searches over time for individual users. Supports audio and images – for example, you can include sound recordings of a mother-tongue speaker pronouncing a word, that dictionary end-users can listen to in order to hear the correct pronunciation. A Web-based administration interface allows you to check your dictionary's search statistics at any time. Localisable user interface: Users can use the dictionary in their own language. Comprehensive User and Subscription Management, as well as optional IP-based authentication. Advanced nearness searches, e.g. 'find "dog" within 4 words of "cat"'. Search box "auto-complete / suggester" option. Scalable: Capable of handling very large databases, with very complex structures. Meta-language customisation: Labelling information within entries (e.g. “noun”, “verb”) may also be 'intelligently' automatically presented to the user in their own language. Optional feedback form allows end-users to contact the dictionary production team directly. Drive sales of your hard-copy or electronic dictionary products by marketing them on your online dictionary. Promotes the activities of your organisation. WAT Online (Woordeboek van die Afrikaanse Taal) (The Dictionary of the Afrikaans Language). Demonstrating an 'XOR' search with results as KWIC-style hitlist.